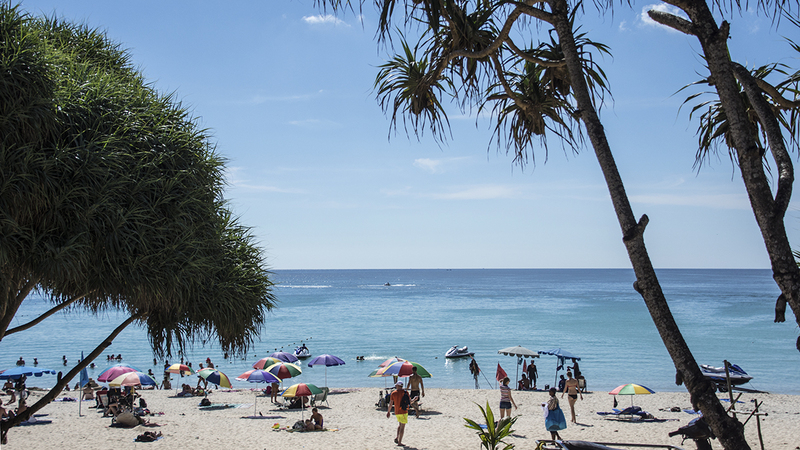 I love Kata Beach, but we are not far from the equator, so don’t forget the sunblock! I always feel right at home on the island of Phuket, but one thing I try to never forget is that the island’s location is a LOT closer to the equator than where I live, so the sun can be unbelievably more intense. I can promise you that if you aren’t careful, you will get burned unless you take a few precautions. It’s usually a good idea to watch out for the sun around 11 am until about 5 pm. I would most definitely suggest using some sunblock if you are going to be outdoors for a long period of time, possibly look for some shade, maybe find an umbrella, or some other means of minimizing the intensity of the sun, or just stay inside. Obviously this does not pertain to the rainy season when the only thing you are trying to do is stay dry! Walking along the sand at Kata Beach. I thought this might be a good time to bring up the pronunciation of Phuket. I realize that most of you know this, but to my friends that don’t, the island of Phuket is pronounced with a hard sounding “P”, with the “h” silent, NOT by making the “Ph” sound like an “f.” Ph isn’t always pronounced this way, but the vast majority of the time it is…but I digress. As I mentioned in the first paragraph, watch out for the sun, really. Please! We didn’t, and most of us ended up with pretty bad sunburns. I decided to stay indoors for several days and let my burn heal a bit, so I am not joking when I say, watch the sun. It’s just way too easy here to overexpose yourself and end up with a bad burn and a lot of itching and peeling! Phuket Town beach, near the Saphan Hin Park. Fortunately for me, during my sunburn period in Phuket one of the days ended up being a cooler, cloudy, overcast day, which allowed me to get outside and walk around a bit. Two years ago, when I was last here, I remember walking down the winding streets of Phuket, to a beach on the edge of town. 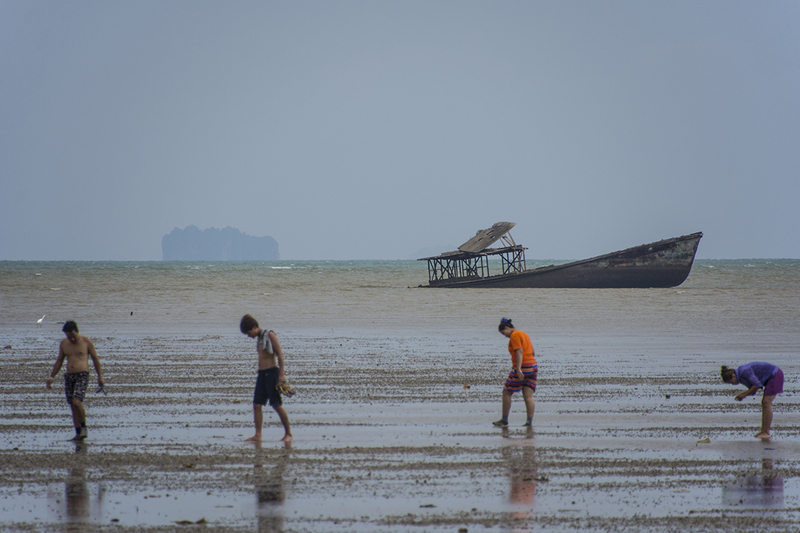 I remember I followed a concrete path that meandered through mangroves and dried up marshes until it took me out to the Andaman Sea. I also remember this not being one of the more impressive beaches on Phuket Island, but still having a bit of it’s own flair, with a ship that had run aground off the coast. Who knows how long ago the boat sunk there, but it definitely makes for an interesting conversation piece! So, on this day of recovery from my sunburn, I headed back to that concrete walkway, strolled down to the beach with the sunken ship, and saw that it was still waiting for me to photograph it in all it’s glory. Ao Yon Beach, one of the best beaches on the east side of Phuket, and one of our favorite beaches! Phuket is an island full of world-class, unbelievably beautiful beaches, with darker and lighter shades of blue and turquoise, so naturally it was time to visit another one! That day would bring us to one of the best on the southeastern side of the island, Ao Yon Beach. 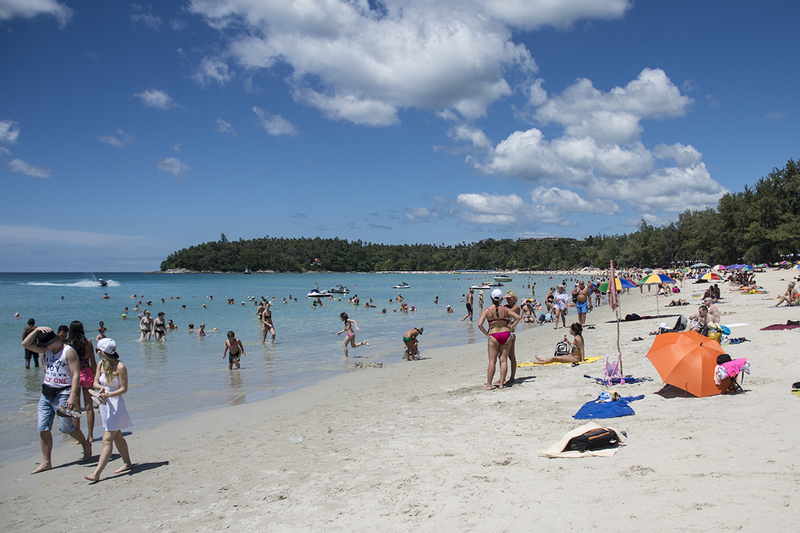 The mix of fine sand and rocky terrain located a bit to the west and south of Phuket Town is a beach not to be missed. It’s less than 30 minutes from the city, so sometimes, amidst all the other beautiful beaches spread out all over the island, this gem tends to get overlooked. It’s sand has a great feel to it, so soft and fine, running through your toes. 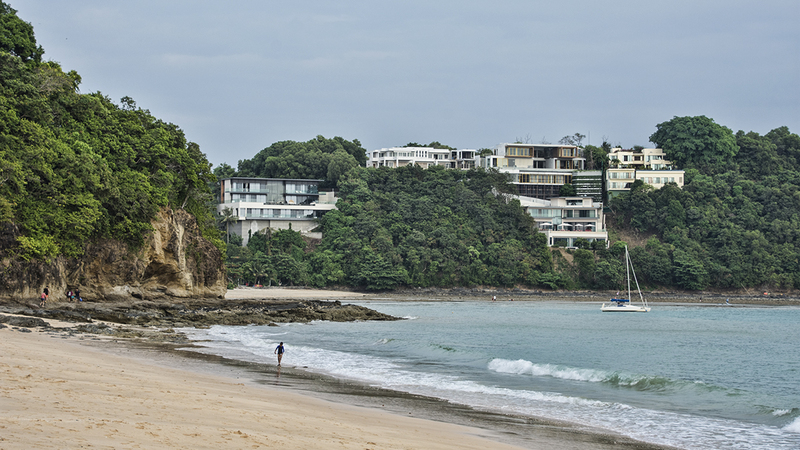 Another plus for this beach is that the drop-off here is very gradual, so it is a great place to swim and cool off, in refreshingly comfortable water, on a late afternoon or early evening. 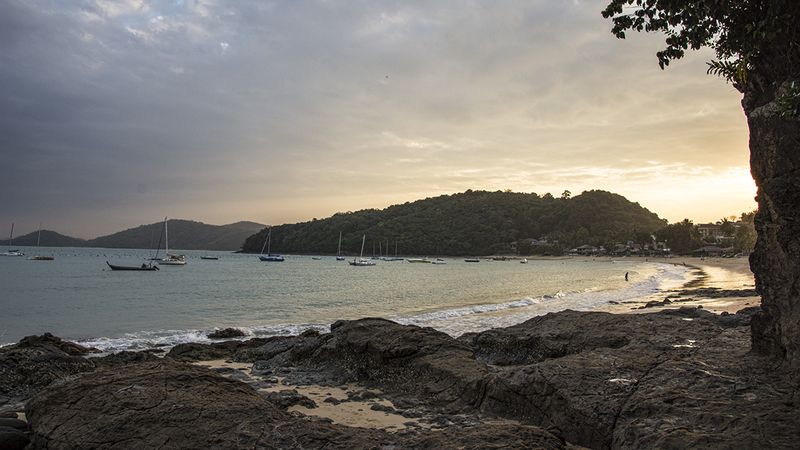 Looking back at Ao Yon Beach before sunset. Typically a trip to Ao Yon Beach in the late afternoon means a visit to Kao Khad viewpoint to watch the sun set, and as expected, the group was unanimous in their vote to do just that. The sunsets from this viewpoint can be spectacular, and even though this night wasn’t the most amazing we had ever seen, we still left extremely satisfied, with smiles on our faces. One of my favorite activities on the island of Phuket is to find a comfortable place to relax about an hour or so before the sun sets, and watch mother nature put on her show. Very seldom will I ever be disappointed. And, now sitting home here in the United States, three months removed from the island, I can promise you that there were far more amazing evenings than there were disappointments for me. I am hoping some of these sunset photos I post over the next several months, along with my stories, will bring a bit of joy to everyone that reads and sees them. After our busy evening, we found ourselves heading back to Sakul House for a few rounds of beer to close out the night, and it was then that I learned I would possibly be getting a motorbike the next day, something I had been waiting on and hoping for, for almost two weeks now. I was finally about to get my rental. I had mixed feelings about trying to ride a motorbike. As a young adult, I just couldn’t get the feel of them, and crashed into fences the only two times I tried to ride them. But, that was a long time ago, on another continent, so hopefully this time my experience on a bike would be much more pleasant. I hope everyone will come back to read about my further adventures, which include trying to stay balanced and ride my rental motorbike in one of the most dangerous places on Earth to ride! Along with my motorbike adventures, I will be talking about more of the various beaches on the island, and how I would rate them. So for now, safe travels to all my fellow travelers, peace, out! 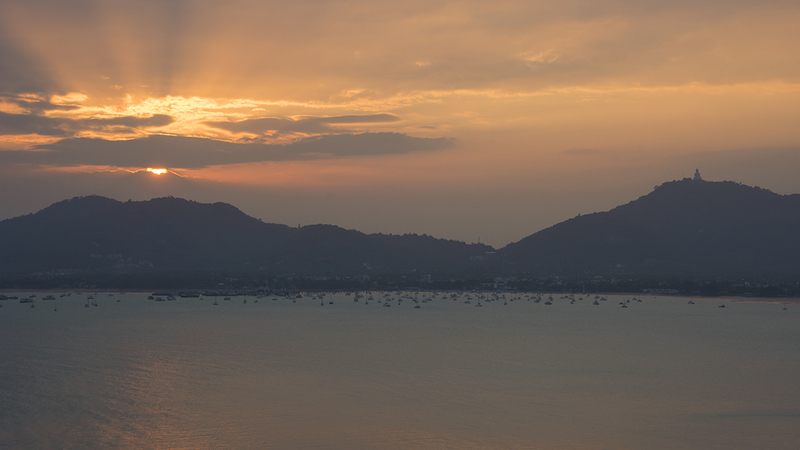 The view of another beautiful sunset from Kao Khad Viewpoint on Phuket Island, with the Big Buddha sitting grandly atop one of the highest points on the island.